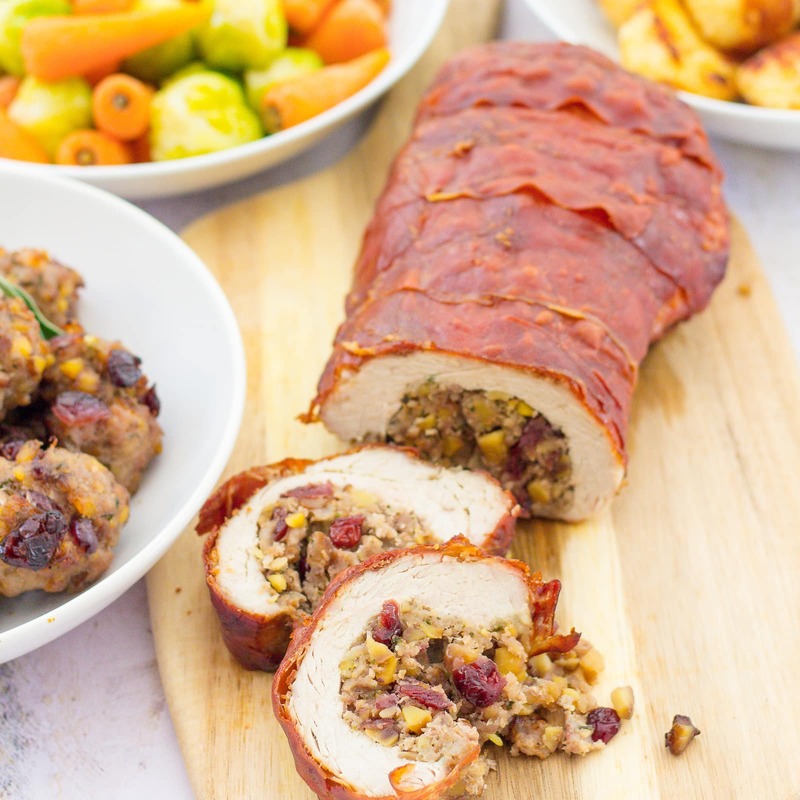 Juicy, tender turkey breast rolled round a flavoursome sausage stuffing and wrapped in crispy prosciutto, this showstopping Rolled Stuffed Turkey Breast is your answer to a stress-free Christmas! Ah the age-old dilemma: do you go for a showstopping Christmas main with maximum stress, or a more paired back Christmas main with less stress? 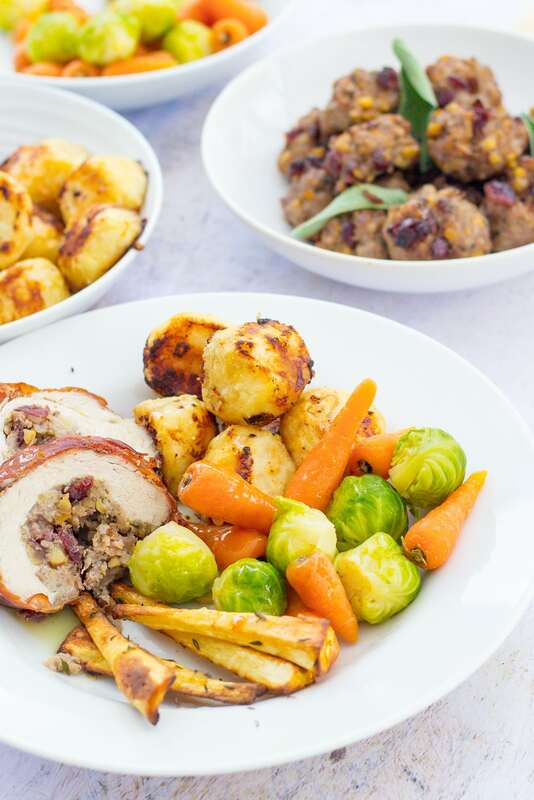 This Rolled Stuffed Turkey Breast delivers on both Christmas centrepiece drama AND it’s easy peasy to make! Prefect for a stress free AND impressive Christmas lunch. 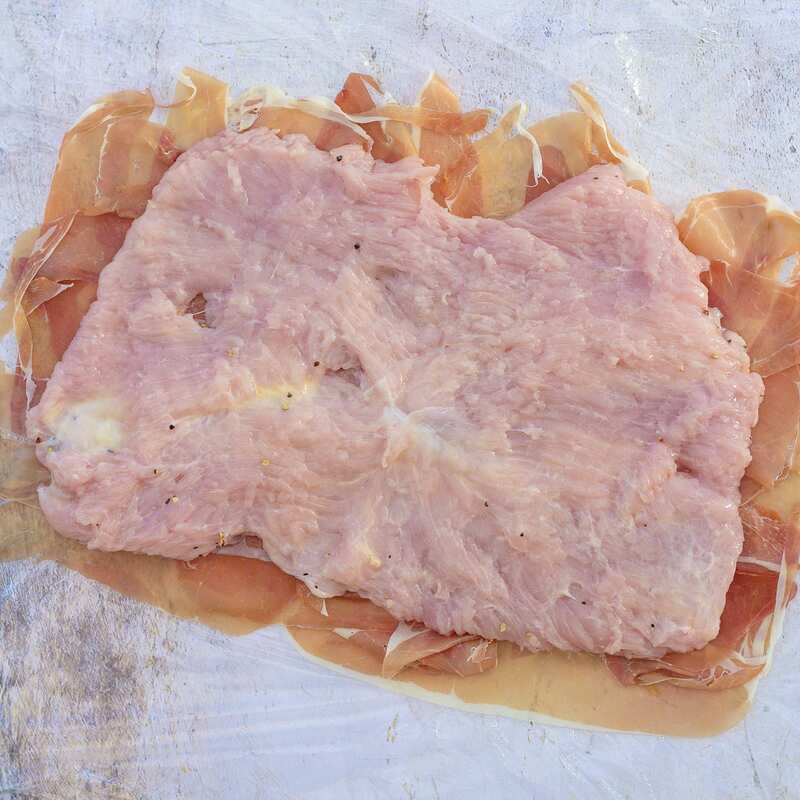 Simply lay out the prosciutto on cling film, butterfly the turkey (i.e. slit the turkey through the middle, stopping just before the end so you can open the turkey breast out like a book), top with stuffing and roll! All this can be done the night before, so all you have to do on Christmas Day is pop the Rolled Stuffed Turkey Breast in the oven and cook some veggies. And this Rolled Stuffed Turkey Breast cooks fast! Just 1 hour of cook time and 10 minutes resting is all it takes. So you can spend less time in the kitchen and more time with your loved ones this Christmas! 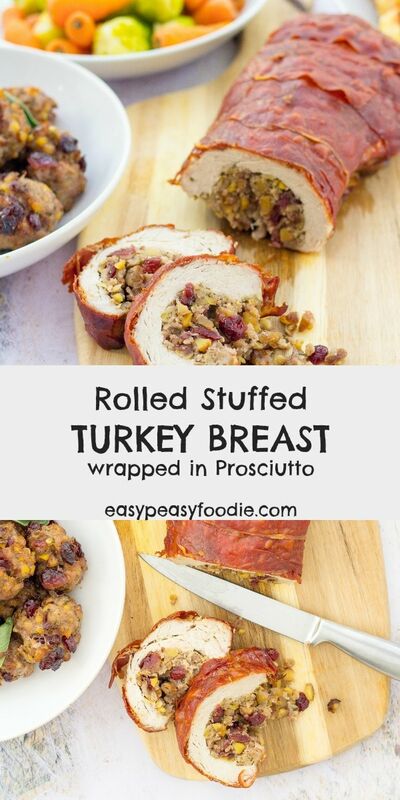 This Rolled Stuffed Turkey Breast is also very easy to carve – simply cut off thick slices with a regular sharp knife – no need for a carving knife! And did I mention how much more flavourful this is than a standard roast turkey? Instead of just plain turkey you get the delicious intermingling of prosciutto, turkey and sausage stuffing. Plus, the prosciutto protects the turkey from the drying tendencies of the oven, instead making the prosciutto super crispy, whilst keeping the turkey juicy and tender. 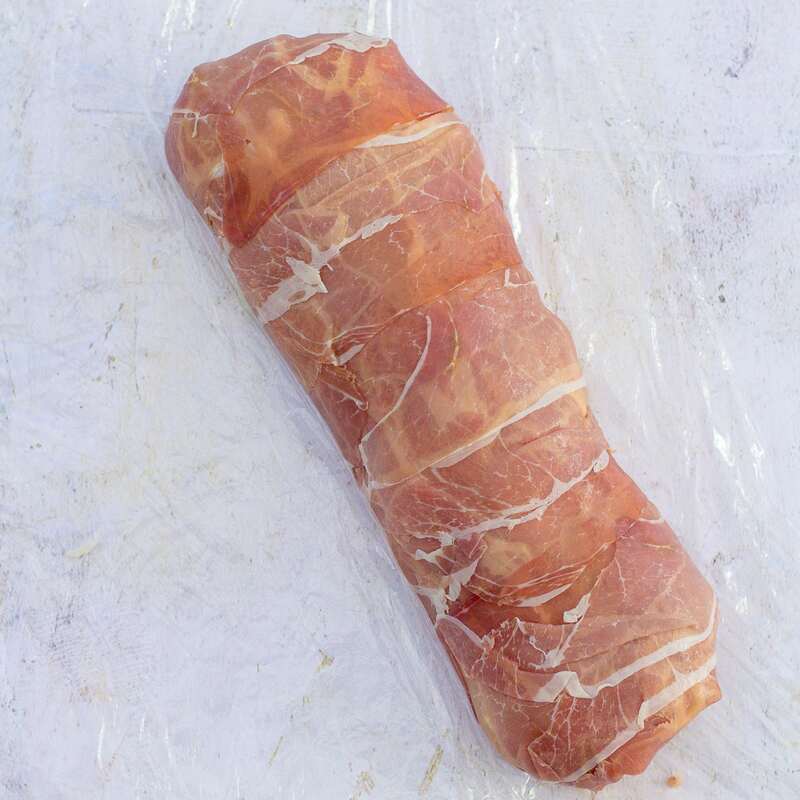 This prosciutto wrapped stuffed turkey breast is a great choice for those who like to get ahead for Christmas, as it can be frozen before cooking (so long as none of the ingredients have previously been frozen). Simply defrost for 48 hours in the refrigerator, then cook as per the recipe below. This Rolled Stuffed Turkey Breast is also great if you’re looking for a budget option for your Christmas lunch – this gorgeous turkey centrepiece cost me just £13.25* – a fraction of what an impressive turkey centrepiece usually costs at Christmas! Add a few veggies and a jug of gravy and you could have a slap-up Christmas lunch for 6 for under £15 – that’s just £2.50 per head! 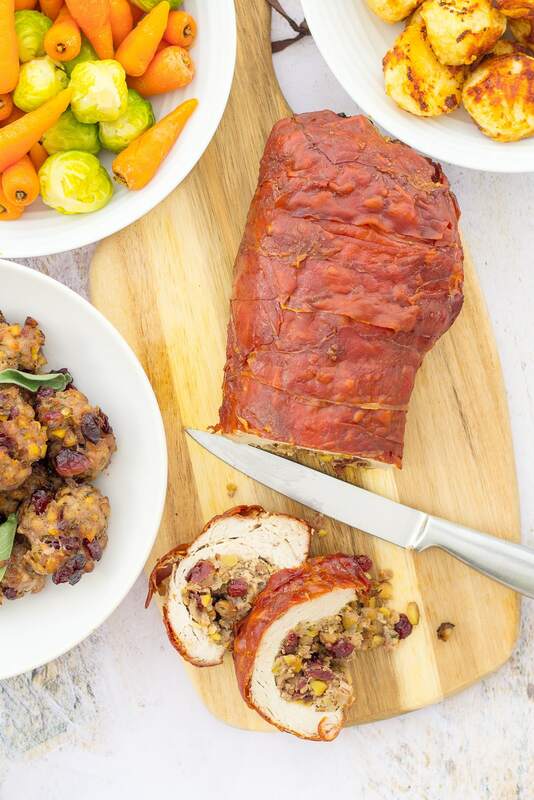 This Rolled Stuffed Turkey Breast also a great choice for a smaller gathering – it serves 4-6, depending on appetite, and makes great leftovers too! If there’s just 2 of you on Christmas Day this year, then why not make this to serve with traditional Christmas vegetables on Christmas Day and serve cold with my Warm Christmas Rice Salad on Boxing Day? 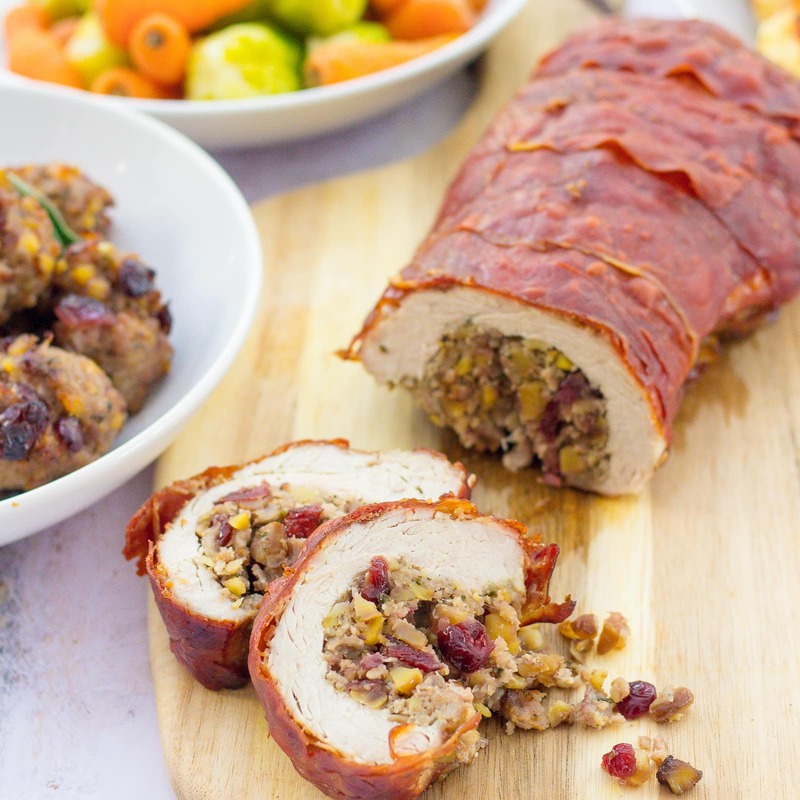 I have chosen to use my NEW Cranberry, Chestnut and Sausage Stuffing in this Rolled Stuffed Turkey Breast – it works so well and is utterly delicious. And while we’re on the subject, I make no apology for the fact that the stuffing is simply tumbling out. In my opinion more is more when it comes to stuffing! 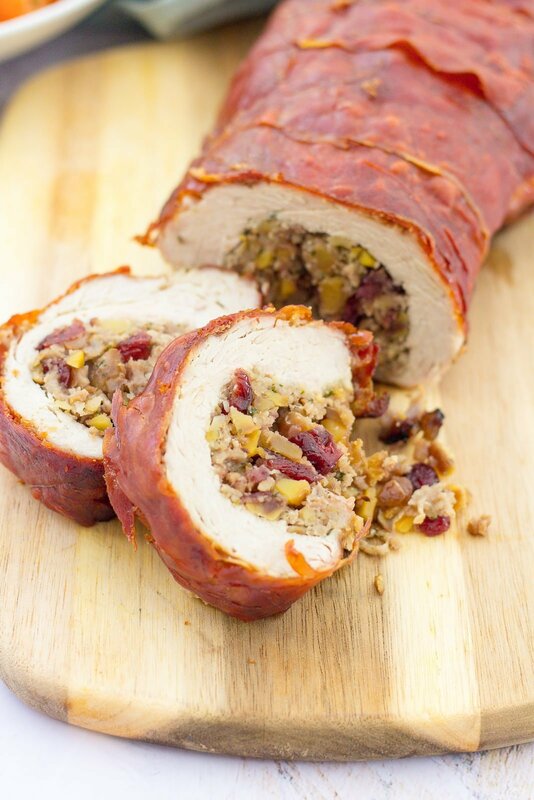 But if you prefer less stuffing and more of a swirl in your stuffed turkey breast, simply cut down on the stuffing. I’ve used 600g here, for a tighter swirl 400g would be about right. 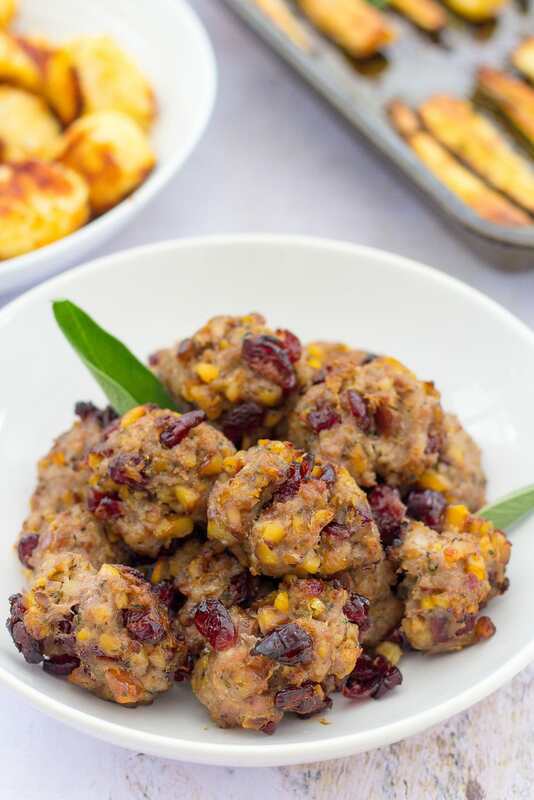 You could always turn the rest of the stuffing into balls and cook as per my Chestnut and Cranberry Stuffing Balls recipe. 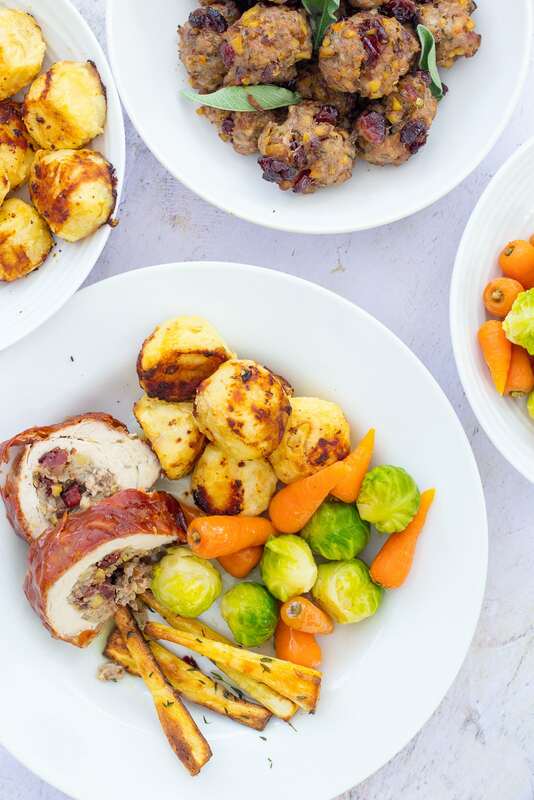 For a stress-free Christmas Dinner, serve this Rolled Stuffed Turkey Breast simply with roast potatoes, roast parsnips, carrots and sprouts – plus a jug of gravy and a jar of cranberry sauce (or make your own if you have the time!). My top match for this Rolled Stuffed Turkey Breast, with its combination of prosciutto, turkey and sausage meat, would be a Côtes du Rhône or another Southern French red featuring a combination of Grenache and Syrah. Alternatively you could go for a Grenache/Shiraz blend from Australia or South Africa. A juicy Merlot from Chile, New Zealand or the USA would also work well here. I wouldn’t naturally choose a white wine to go with this, but I guess an oaked chardonnay would work at a push. Lay a piece of clingfilm, roughly 30cm x 40cm (12in x 16in), on a board. Butterfly the turkey breast – i.e. slit the turkey breast through the middle, stopping just before the end so you can open the turkey breast out like a book. 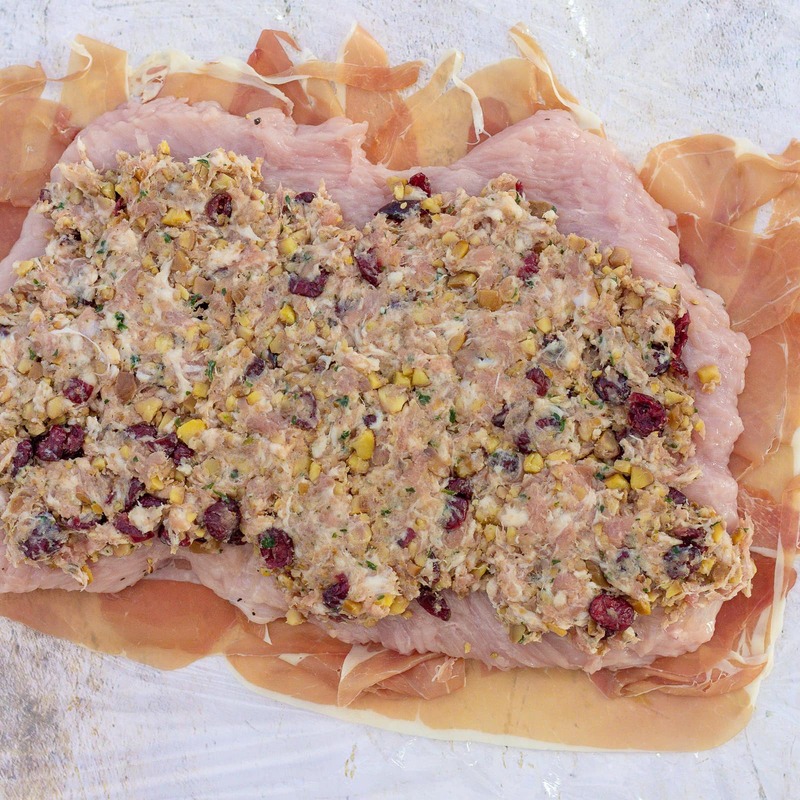 Lay the turkey on top of the prosciutto rectangle and then spread over the stuffing. The stuffing should completely cover the butterflied turkey breast, except not quite all the way to the edges. Using the clingfilm to help you roll the turkey breast starting with one of the longer sides and rolling towards the other long side (i.e. so you end up with a long thin roll not a short fat one). Place the rolled stuffed turkey breast on a roasting tray with the seam facing downwards. Place in your preheated over for 1 hour. (The internal temperature should register 165F or 75C). Leave to rest for 10 minutes then serve, cut into think slices, with all your favourite Christmas vegetables and sauces. Suitable for freezing (provided none of the ingredients have previously been frozen). To freeze AFTER cooking, cut into slices and place in a plastic freezer box. Defrost for 24 hours in the fridge. Serve cold or hot. To reheat, wrap with foil and cook for 20 minutes at 180C / 160C fan/ gas mark 4 / 350F. Always check the turkey and stuffing is piping hot before eating. There won’t be many of us for Christmas this year and this would be the perfect size! I love how many different textures and flavours you’ve brought together for one dish, it just looks mouthwatering! 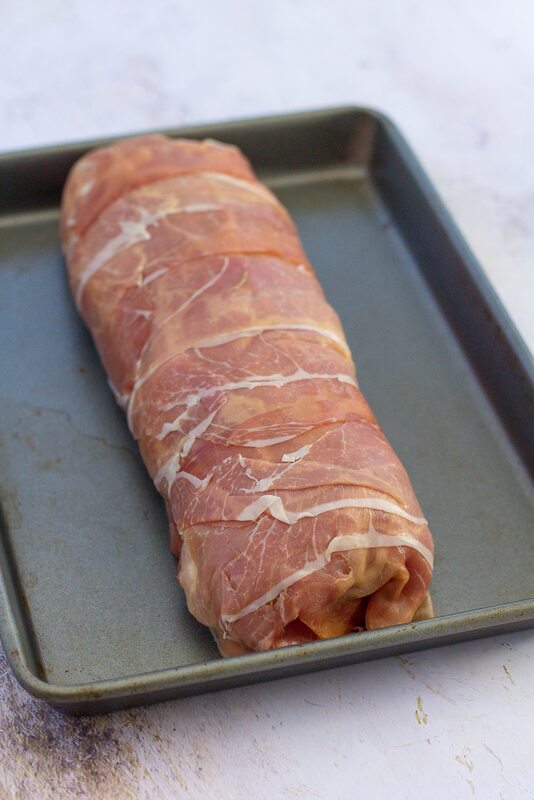 I love the look of this rolled turkey breast. The sides and the stuffing look fabulous too. Oh yes please a great dish for smaller families Eb. You are really on a roll with this Christmas lark. I tend to bury my head in the sand . This is such a pretty dish and looks deceptively simple to make too. I love the idea of serving it cold with your amazing rice salad on Boxing Day. We had this today! So delicious and super easy to make, cook and serve. It looked fantastic too. I couldn’t find a turkey breast joint so just used turkey steaks which I tenderised first. I used turkey sausagemeat as I am intolerant to pork.